Yesterday afternoon, rumors circulated that Republican gubernatorial candidate Walker Stapleton would finally address what’s emerged as a significant problem for his campaign. Stapleton’s dubious claim to a a “fourth generation Coloradan” rests on the legacy of his great-grandfather and former Denver Mayor Benjamin Stapleton, who rose to power with the support of the then-powerful Ku Klux Klan. Even as debate rages over changing the name of the Stapleton neighborhood in Denver and the New York Times profiled the controversy in depth, Stapleton has doggedly refused to respond except to say he is “looking forward”–this after having celebrated Ben Stapleton in previous campaign ads. Until yesterday, when Stapleton sat down with CBS4’s Shaun Boyd for what we fully expect he believed would be the end of the matter. And then Boyd, one of the state’s most experienced but less confrontational political reporters, did something few expected. You see, gentle readers, all this time as Stapleton and his press flaks reacted with feigned indignation to the merest suggestion that Stapleton should answer questions about his family’s KKK history, there was an easy connection to straight-up, undiluted white nationalist racism sitting in plain view the whole time–repeat GOP gubernatorial loser and ex-Rep. Tom Tancredo, who sat on the board of the white nationalist organization VDARE during the recent controversy in which that group was denied conference space in Colorado Springs. The VDARE scandal was just the latest in a decades-long career highlighted by unabashed racism so pervasive that Tancredo was declared persona non grata in George W. Bush’s White House. But where Stapleton’s cousin George W. Bush shunned Tancredo, Stapleton embraced Tancredo to win over the state’s stridently conservative Republican primary voters. As Boyd reports correctly, during the primary Stapleton said he’d “love to utilize” Tancredo in his administration, even hinting to voters that Tancredo might be his lieutenant governor pick. Today Stapleton says that’s “laughable” and “hogwash.” But after Boyd lays out the facts, that only makes it worse. It’s not hyperbole to suggest that this could be a turning point in the governor’s race. 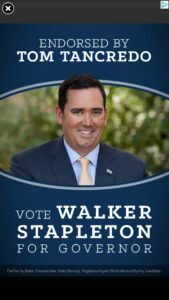 The Stapleton family’s KKK history is a controversy that almost everyone agrees Walker Stapleton should have easily overcome. He could have taken care of this in 2010, when in addition to celebrating Ben Stapleton he could have taken two seconds to acknowledge Ben’s imperfect record. He could have done so at any point this year as the inevitable stories were written, and his refusal to make the simple, clear statement needed to get out from under his great-grandfather’s shadow became a story of its own. Stapleton’s allies like the Phil Anschutz-owned Colorado Springs Gazette put their own credibility on the line, lambasting the New York Times, the Denver Post, and everyone else who dared bring this subject up with rhetoric that can only be described as totally unhinged. After this unexpectedly disastrous interview, it’s Stapleton’s defenders who are wondering what the hell comes next. As for Tom Tancredo? Walker Stapleton is no victim here, he opened the door and let Tancredo in. As a result Tancredo’s divisiveness and toxicity, one of the best-known reputations in all of Colorado politics, could help cost Republicans the governor’s race for the third consecutive election cycle. And that is really quite extraordinary. Tom Tancredo. The gift that keeps on giving. He's like the new drug resistant clap. If only Stapleton had claimed to be a 3rd-generation Coloradan, none of this would have happened. Does Staplegun realize hogwash is a thing? Great remedy for crotch rash. Apply liberally (I’m talking to you Nutter); this signature rash, aka today’s Republican Party, is reaching epidemic levels. 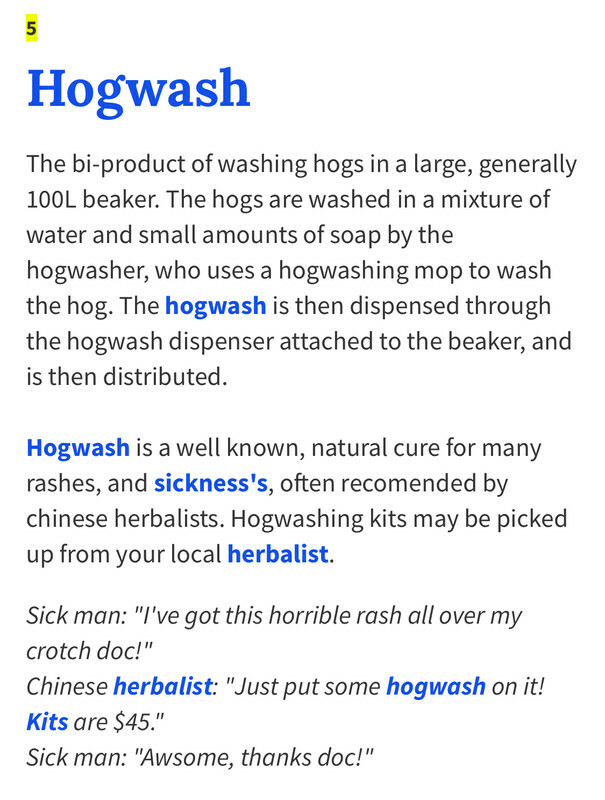 Ironically, one of the casualties of T****ps elegant trade war is cheap hogs; making bigly amounts of hogwash won’t bankrupt us. I get the impression that Stapleton has created a toxic relationship with the press by being uncomfortable with them and inexperienced at talking to them. He gets some minor bad press over minor missteps over shining up his ancestors legacy while ignoring the dark parts. In a normal relationship with the press this would disappear in the large volume of information and with a little correction/spin. A statement about making mistakes while being overall good, etc. With Stapleton he instead goes into press lockdown trying to avoid any more negative stories and only goes to friendly Republican talkshows that will toss him softballs. He does not get more comfortable with giving real interviews and meanwhile all sorts of difficult questions build up. So when he finally gives an interview there are lots of hard questions one after another. Then Stapleton goes back into press lockdown and repeat. The article Patricia Calhoun of Westword wrote about Stapleton is illustrative of this. No friendly brush off after a handshake, instead he turns away saying, "I can't talk to you." "repeat GOP gubernatorial loser and ex-Rep. Tom Tancredo…"
In fairness to Tanc, isn't he only a one-time GOP gubernatorial loser and a one-time Constitution Party gubernatorial loser? Why are all these damned racists associating with my campaign?!?! Kudos to Shaun Boyd. That's how journalism is done, boys and girls.